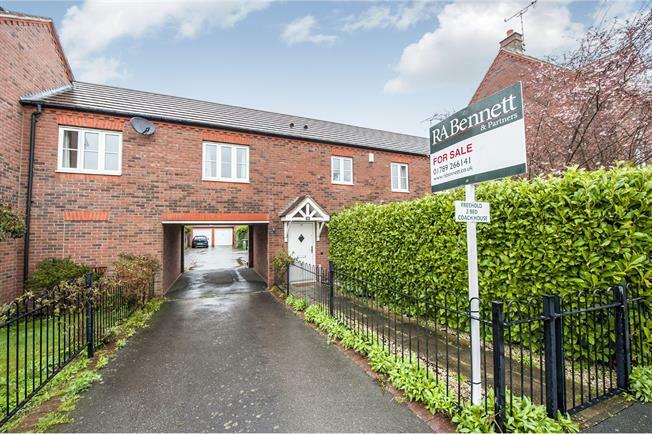 2 Bedroom Semi Detached House For Sale in Stratford-upon-Avon for Guide Price £190,000. A stunning two double bedroom Freehold coach house with a South facing private garden on this popular modern development in Lower Quinton. Affording the discerning purchaser well proportioned accommodation with open plan living room enjoying dual aspect measuring over 26ft x 17ft and a contemporary kitchen with integrated appliances. There are two double bedrooms with walk in wardrobes and a bathroom. Integral single garage with two additional parking spaces. Presented to an extremely high standard throughout we would strongly recommend that you view this property. With stairs rising to the first floor and a door leading to the integral garage. Radiator. With doors leading to all rooms and two double glazed windows to the rear elevation. Being a stunning room with dual aspect and a light and airy feel. The sitting thru dining area has two double glazed windows to both the front and rear elevations. Solid wood flooring and four radiators. The stylish kitchen has a range of matching wall and base units with under cupboard lighting including granite effect roll edge work surfaces incorporating a ceramic sink and drainer unit. Integrated is a Samsung four ring electric hob and Bosch oven. Further integrated is a washing machine, dishwasher & fridge. Ceramic tiled floor. Double glazed window to the front elevation. Having a double glazed window to the front elevation. Radiator. Walk in wardrobe with light. Double glazed window to the front elevation. Built in double wardrobe. Radiator. A white suite comprising of a low level WC, wash hand basin and panelled bath with shower over. Ceramic tiling to the floor and complementary tiling to the walls. Double glazed obscure window to the rear elevation. Radiator. Extractor fan. Up and over door. Further space for a fridge freezer. South facing enclosed garden. Pebbled sunken seating area .